Based on the classic novel, the film follows 14-year old schoolgirl Dorothy Gale who lives on a Kansas farm with her Aunt Em and Uncle Henry, but dreams of a better place "somewhere over the rainbow." After being struck unconscious during a tornado, Dorothy dreams that she, her dog Toto, and the farmhouse are transported to the magical Land of Oz. There, the Good Witch of the North, Glinda, advises Dorothy to follow the yellow brick road to the Emerald City and meet the Wizard of Oz, who can return her to Kansas. During her journey, she meets a Scarecrow, Tin Man, and a Cowardly Lion, who join her, hoping to receive what they lack themselves. All of this is done while also trying to avoid the the Wicked Witch of the West and her attempt to get her sister's ruby slippers back from Dorothy. 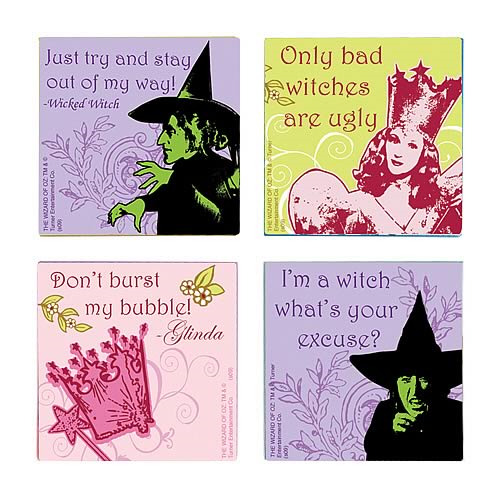 This wood tile magnet set features four distinct images - "Just try and stay out of my way! ", "Only bad witches are ugly", "Don't burst my bubble!" and "I'm a witch, what's your excuse?". Each magnet measures 2-inches tall x 2-inches wide. Order yours today!